A prominent Honduran activist has lost his bid to become the first openly LGBT person elected to the country’s congress. Diversity Movement in Resistance’s Human Rights Committee Coordinator Erick Martínez finished 71st out of the 207 candidates from the Francisco Morazán Department in primary elections that took place on March 12. Martínez was one of 23 candidates from the Liberty and Refoundation and Anti-Corruption Parties, a left-leaning coalition that opposes President Juan Orlando Hernández’s ruling National Party, who were on the ballot in the Francisco Morazán Department in which the Honduran capital of Tegucigalpa is located. The five candidates who won the most votes will advance to the country’s general election that will take place in November. Martínez was one of four openly LGBT candidates for the Liberty and Refoundation Party, which is known by the Spanish acronym LIBRE, who ran for the Honduran Congress in the 2012 primaries. He told the Washington Blade on Wednesday from Tegucigalpa that he finished 74th out of the 93 candidates who ran in Francisco Morazán Department. “There is truly an advance,” Martínez told the Blade, referring to this year’s results. 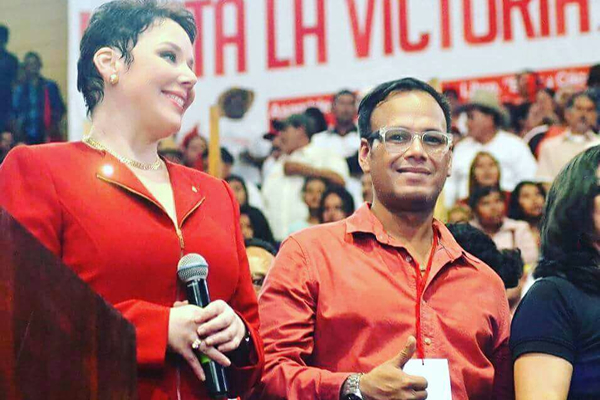 Zelaya’s wife, Ziomara Castro, is the Liberty and Refoundation Party’s presidential candidate. She ran against Hernández in 2013. Honduras is a Central American country that borders Guatemala, El Salvador and Nicaragua. Cattrachas, a Tegucigalpa-based lesbian feminist network, notes 229 LGBT Hondurans were reported killed between 2009 — the year in which a coup toppled then-President Manuel Zelaya — and 2016. René Martínez, a prominent activist in the city of San Pedro Sula who was a “well-known” member of the National Party, was strangled to death in June 2016. Kendra Jordani, a transgender woman and activist who is studying journalism in San Pedro Sula, is among the 20 candidates for the Guatemala City-based Central American Parliament, which includes Honduras, who will advance to the general election. Jordani, like Martínez, is a member of LIBRE.